“Where’d the rocks come from? From the same place the car went to. I don’t know yet.” During my youth I spent many hours next door with the neighbor boy. Not just for having fun or horsing around, but also because in their veranda there was a disused closet with sliding doors where you could always find some old comics lying around. I suppose these were from the older brother who was a real comic fan. Many hours I spent sitting in front of that closet, reading them all. Comics like “Archie the man of steel”, DC comics and of course Marvel. My favorite was “The Fantastic Four”. This series I found extremely fascinating and that because it was a collective, consisting of several superheroes with different super powers. They formed a close-knit family and their identity was known to the population so these heroes had a rather family character. Actually, they were a little bit the forerunners of “The Avengers” and the figure of “The Hulk” resembled that of Ben. Unfortunately, this film is labeled as an unnecessary and worthless reboot. I partially agree with that. The only thing is that I can’t judge whether this is an unnecessary reboot or not. I’ve never seen the previous films made in 1994 and 2005. Saying this is a failure or total disaster though, is something I don’t fully agree with. A big part of the film I enjoyed watching and personally I thought it was interesting enough. The introduction of the various members of the unprecedented four was extremely captivating. The beginning showed a young Reed Richards (Judge Owen). A genius who seemed to come from Mars, according to some of his classmates, and who’s building a futuristic machine in the garage. A missing component he finds on a junkyard where he bumps into young Ben Grimm (Evan Hannemann). The experiment proves to be a success and things can be materialized to an unknown destination and brought back again. Years later Reed (Miles Teller) and Ben (Jamie Bell) attend a science fair, where they attract the attention of Dr. Storm (Reg E. Cathey) and his daughter Sue (Kate Mara). And before they know it, they are in a sophisticated lab rebuilding their invention on a large scale. This introduction was the most successful part for me. It felt like an adventure film in which a boy pursues the realization of a dream. In an amateurish and childish way, the prototype of something big is made out of junk (a bit like in “Project Almanac“). Also the introduction to the various members who become part of “The Fantastic Four” in the Baxter Foundation, made this film different of other superhero movies. Mostly this part is kept short so they can move on to the action part immediately. The moment things start going wrong with the four noticing something happened to their bodies after they’ve jumped to the other dimension (while being drunk), it’s still interesting enough. You witness how each of them discover their new capacities. But when the action-packed part of the film starts, it’s no longer fantastic. It turns into an uninspired, quickly made up heroes-movie. As if they suddenly realized that stuff should be in it too. The visuals of the other dimension are still enjoyable, but the final stage feels rather flat and not very original. And certainly because nowadays as a moviegoer, you’re burried under tons of superhero-movies. 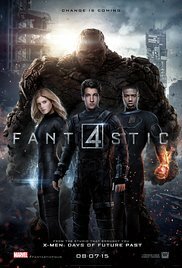 Ultimately, this film emphasizes the formation of and relationships between the members of “The Fantastic Four”. The superhero action that you ultimately expect, is fairly limited. A film that takes 90 minutes, with only a demonstration of superpowers and a final clash of fifteen minutes, can hardly be seen as a superhero movie. Perhaps this change was welcome anyway, after all the Marvel releases in recent years. The fatigue comes into play when it’s about this genre. Perhaps the final part of the movie wasn’t so great, but it wasn’t painfully bad either. And now I’ll just wait for “Deadpool” …. I saw the original 2 F4 movies. They were superior to this. This latest film is not the F4, and deserved to fail. The first 2 deserved to be completed as a trilogy, but of course it wasn’t.